Ever felt like you’re talking to a brick wall!? Well, we’ve got a wall that talks back!! We’d like to hear all about what you’d like to see happen here at the Hub, and in the wider community. We also have sections on good free stuff in Dunfermline, Dunfermline fun facts and what you like about Dunfermline. We also want to hear from you, if you think you’ve got something to contribute. Every person who comes to the Hub has a skill, craft or talent, and we’d like to hear if you’d like to contribute. You can give your time, skills, crafts, donations, anything! Time – volunteer to help out at our events, or take a regular slot in our advice and information service. Donations – we’re always needing consumables, such as tea, coffee, biscuits, milk, sugar, as well as furniture and children’s clothes. Are you a good baker, or grow your own fruit or vegetables and would be happy to give away your extras? Skills – are you a good joiner, electrician, decorator, graphic designer, cleaner, crafter, knitter or seamstress ? We’d like to hear about skilled people that can help citizens and local charities in our community who need an extra helping hand? Information – have you heard about a service, and think everyone needs to know about it? Tell us and we’ll get the information out to anyone who needs it! 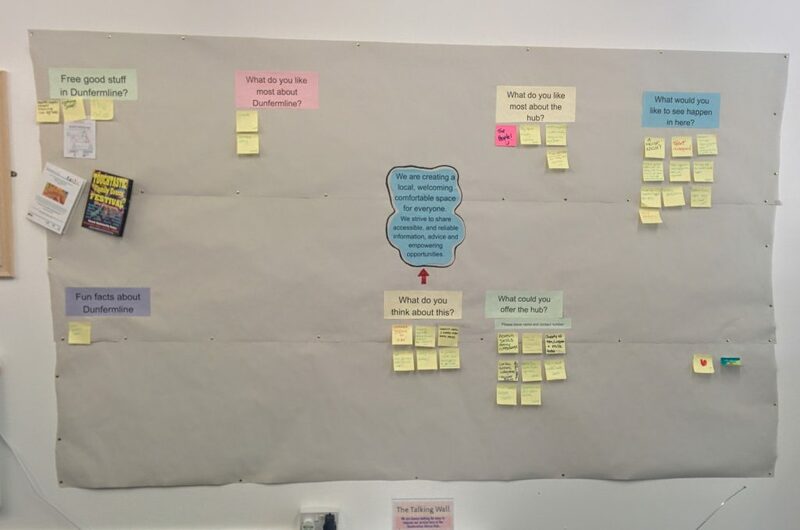 Pop in today, contribute to the Talking Wall, and be part of something big!